Modern Dads is a new reality show on A&E, which follows the lives of four stay-at-home dads: the veteran dad, the new dad, the single dad, and the stepdad. Each week, we follow their ordinary, everyday experiences as primary caregivers, a life that includes changing diapers, driving their children to activities, meeting at the local park (or the “stay-at-home dad’s headquarters”), shopping for groceries, and finding time to spend with their spouses. Though being a stay-at-home dad could be isolating, these dads have developed a support system, weighing in on each other’s marital issues, babysitting for each other, and even giving parenting advice. They live by the “dad code”: 1. No fanny packs; 2. Don’t narc on a daddy for having a beer in the afternoon. 3. No desperate diaper dad gets left behind. In other words, they call each other out when needed, they don’t rat on each other, and they support their own. Though some of the scenarios seem staged (after all, how interesting are ordinary lives anyway? 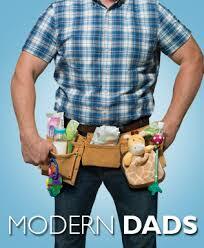 ), the show gives us an entertaining and probably realistic glimpse of the life of a modern stay-at-home dad. These dads do not inhabit a traditionally masculine arena; their lives are mostly contained in the private sphere and they take on a role historically assigned to women. Yet, despite their gender nonconforming lifestyle, the dads still police each other’s masculinity, though their gendered boundaries reflect their unique circumstances. For example, the single dad, Stone, is sexist, indiscriminately hitting on and objectifying women, but he enlists the child of a friend as a wingman (and yes, this is as creepy as it sounds). Stone offers to babysit for the new dad, Nathan, while he works as a professional photographer. Stone is elated to hear that this is a boudoir shoot and uses Nathan’s child to sneak into the room and peek at the model. Likewise, the veteran dad, Rick, freely gives advice on diaper changes, but won’t give up his truck for a minivan because “you can’t put a price on your masculinity.” Even in the nontraditional world of stay-at-home dads, masculinity, and the fear of seeming emasculated, weighs heavily on the minds of these fathers. Still, I liked this show, partly because it is funny and mostly because it provides a positive model of fatherhood. These men love their children and they love being dads. Most inspiring is the support system that they have developed with one another. When we discuss women’s success in the workplace, we talk about the importance of strong support systems and mentors (see Cheung and Halpern 2010 for examples from the field of business and Wasburn 2007 for examples from academia). The same should be true of men’s success as fathers and stay-at-home dads. The network developed by these men allows them to share advice and tips, lend a supportive ear, and ultimately be better dads. This show not only makes being a stay-at-home dad seem desirable, but also provides a model of how to do it successfully with the support of others. A potential avenue for activist work might be the development of fatherhood support networks, similar to the Lean In “circles” initiatives for women in the workplace. The point of these circles is to connect women together so that they have a support network of other women who understand their situation, can provide career advice and tips, and listen when needed. The men from Modern Dads have already done this informally and it seems to work for them. Some of these programs are already in place for mothers (for example, Mommy and Me) and could likely work for fathers, too (Stone does visit one of these classes with his daughter, but, not surprisingly, in service of finding a date). True support networks could help men deal with the stigma attached with being a stay-at-home dad and make this role seem more desirable. Doucet, Andrea. 2006. Do Men Mother? :Fathering, Care, and Domestic Responsibility. Toronto: University of Toronto Press. Marsiglio, William and Kevin Roy. 2012. Nurturing Dads: Social Initiatives for Contemporary Fatherhood. New York: Russell Sage. ← Guinness, ‘made of more’ or just more of the same?